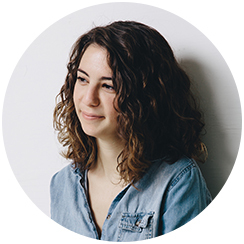 Kirsten Lepore is an LA-based director and animator with an MFA from CalArts. She wrote and directed the first ever stop-motion episode of Cartoon Network’s hit show "Adventure Time." Her films have taken top prizes at SXSW, Slamdance, Stuttgart Animation festival, Florida Film Fest, Arizona Film Fest, Vimeo Awards, the Annie Awards and many others. She's given talks everywhere from Pixar to Portugal and has also been featured in Juxtapoz, Shots Magazine and Animation Magazine, and was named one of the 50 most creative people by Creativity Magazine. With a client list including Google, MTV, Facebook, Nickelodeon, Yo Gabba Gabba, Whole Foods, Toyota and more, her work has been featured on TV, the web, in museums and at 100+ international film festivals. PBS: You’ve managed to create intriguing, vibrant personalities here despite the lack of dialogue. Where did the idea for these two characters stem from? KIRSTEN LEPORE: The initial idea came purely out of a material challenge, which is usually where I start with my stop-motion ideas. Several winters before I made the film, I was watching snow fall in my parents' backyard in New Jersey, and it occurred to me that snow would be a great material with which to animate. I hadn't seen it done before, which made me even more excited to try to craft a story surrounding this material. After brainstorming on the concept for a while, I thought sand would be a fitting counterpart, and developed the story from there. PBS: In this film, there are only two characters communicating through messages in a bottle and there are a variety of notes and objects within it. Through this, it looks as if they are beginning to form true characters with the more they add to their forms. Was there a reason why you chose the items that you did? KIRSTEN: I definitely picked each item carefully for its specific purpose (what would make for good hair or a bra, or what might have weird, comedic or sentimental value) and there were even a couple objects that didn't make the final cut — mainly a Cheetos bag. I really wanted to work a Cheetos bag in there. Didn't happen. But anyway, I think part of the charm of the characters was the way they were able to repurpose trash into treasures for each other. PBS: “Bottle” is a stop-motion short and it looks like this was filmed in multiple locations. How long did it take and what was the process like when making this film? KIRSTEN: This film was so incredibly difficult to make, especially when it was just me making it. Literally just me in the snow freezing and on the beach sweating and getting weird looks from strangers. When I initially set out to schedule shooting, I planned to stay with a friend over my winter break in upstate New York where it was super snowy. However, when I got there, I hadn't accounted for the fact that it was so cold that the snow was powder, rather than packable snow. I tried to make it work and was out there with a squirt bottle trying to wet the snow, but it just wasn't going to happen. I was about to quit and try a different project when I called a friend of mine who had spent some time in Big Bear, California — about two hours from LA — during the winter and said the snow there would be perfect. So I took a leap of faith and it ended up working out. I shot the whole film in the greater LA area, from the beaches to the snow. Still, even though that was one problem solved, there were so many issues and challenges along the way that I could never have foreseen: seagulls flew away with my props, I couldn't take any bathroom breaks (since there was no one to watch my equipment) and had to shoot for eight hours straight until I lost natural light. I didn't use any frame grabbing software that I would otherwise rely on in stop-motion, I had to color correct frame by frame for the changing natural light, and the list goes on and on. The whole process of making the film took nine months, but shooting was about four months of that time. PBS: SPOILER – At the end of the film, they finally meet, but it looks like they fall apart before even reaching one another. Why did you decide to go in this direction? KIRSTEN: To me this seemed like the natural ending; I imagined them dissolving into a new space where they could finally be together or "one." It wasn't until audiences started seeing the film that I realized most of them interpreted it as a sad ending, or as them dying. I always imagined their physicalities to be fluid, as they morph and change shape as they move around and emerge from the ground in different shots. Although I do really love when people bring their own personal interpretations to a film — I think it's more interesting when there's a discussion there. KQED Public Television 9 is one of the nation's most-watched public television stations during primetime. KQED produces and acquires programs that inspire, inform and entertain the people of Northern California. KQED broadcasts the best available programs from PBS, APT and other distributors, and also produces its own unique national and local programs, series, and specials. Airing more independent films than any other public broadcasting station in the country, KQED is committed to bringing the work of local and independent film producers to the community.